Mrs. Ruby Clark Franklin, age 87 of Rosedale Street, Toccoa passed away Wednesday, November 7, 2018 at her residence. A daughter of the late Earl and Pauline Bobo Clark, she was born July 21, 1931 in Union, South Carolina having lived a greater part of her life in Toccoa. 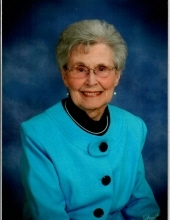 She was a homemaker, a member of the Toccoa First Baptist Church, the Adult Four Sunday School Class where she served as treasurer and was the chair person for the bereavement committee. In addition to her parents, she was preceded in death by her husband, Allison Franklin, grandson, Adam Williams, sister, Florence Maddox, two brothers, James and Willie Clark and by her step-mother, Mable Clark. Survivors include three daughters and sons-in-law, Dianne and Barry Moon, Brenda and Freddie Long and Peggy and Dwight Williams all of Toccoa; son and daughter-in-law, Mike and Charlotte Franklin of Piedmont, South Carolina; nine grandchildren, nineteen great-grandchildren and one great-great grandchild; sister-in-law, Joan Smith of Clarkesville. Funeral services will be Friday, November 9, 2018, 11 O’clock a.m. at the Toccoa First Baptist Church with The Reverend David Ritcey and The Reverend Dr. Henry Fields officiating. Grandsons will serve as pallbearers, Josh Williams, Jeremy Moon, Jay Moon, Jason Franklin, Jamie Long and Randy Long. The family will be at the home on Rosedale and will receive friends at the Acree-Davis Funeral Home on Thursday, 5 p.m. until 7 p.m. Online condolences can be left for the family at www.acreedavisfh.com. Interment will follow in the Stephens Memorial Gardens with The Reverend Jerrell Beatty officiating. Acree-Davis Funeral Home is in charge of the arrangements for Mrs. Ruby Clark Franklin. To send flowers or a remembrance gift to the family of Ruby Clark Franklin, please visit our Tribute Store. "Email Address" would like to share the life celebration of Ruby Clark Franklin. Click on the "link" to go to share a favorite memory or leave a condolence message for the family.